Abrams Falls isn't a very high waterfall, but it can be very "heavy". It's also very beautiful. The hike is also very beautiful. It's a little bit of hike to get to, but well worth it. It is rated as a "moderate" hiking trail, but there are parts of it that seem more like "difficult". The total round trip hike is 5 miles, and should take anywhere between 3-4 hours. And, of course, there's always the danger that you may see a bear wandering around. Appropriate footwear would be hiking boots due to the trekking over rocks, as well as a couple of log bridges. The trailhead is just inside Cades Cove. 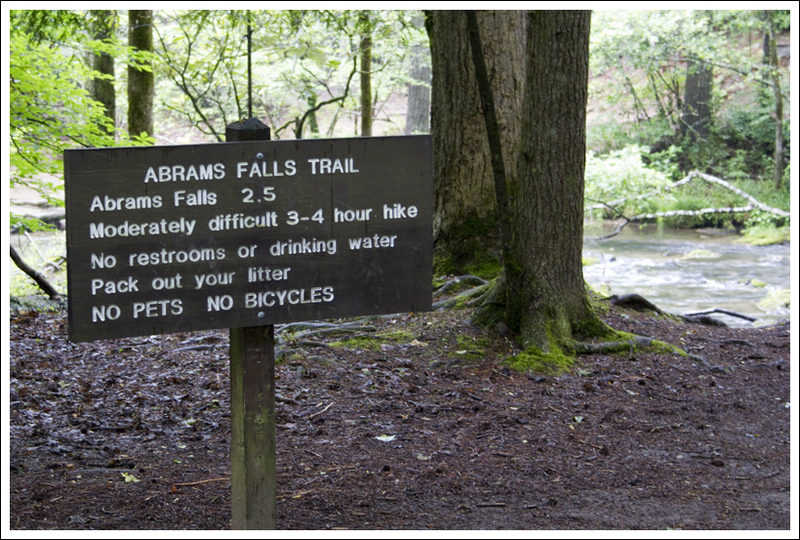 Due to this, if you're planning a trip to Abrams Falls, you probably should add in at least an extra hour to get to/from the trailhead...just in case. There are times when traffic is heavy in The Cove. As with any waterfall, there is a serious danger of drowning if you get in at the bottom of the fall. There have been some deaths due to people not heeding this warnings. www.hikinginthesmokies.com reports that this hike is listed in the top 10 most dangerous hikes in the country. (I'm glad I didn't know that last time I hiked it!) The reason for its listing is the threat of hypothermia, as well as the drowning risk. But, don't let that deter you from hiking to Abrams Falls...it's well worth the hike as long as you respect the surroundings. Gorgeous! I'm a little confused, though. Do most people jump in at the end? Is that why it's so dangerous? Yes, there are some who insist on jumping in near the falls. In fact, just a few years ago, a school child drowned during a class trip. She was wading, got out too far, and the current pulled her under. I don't do hikes that don't have bathrooms along the way, lol. But it sure looks pretty in pictures when others go there. Having seen the Great Smoky Mountains last year when I visited Tennessee, I am anxious to go back and take in some of the sights. 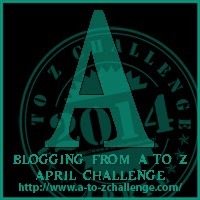 I will be following along on the A to Z.
I've seen the trail head, but I don't think I've ever taken that particular hike. Thanks for the info and the beautiful picture of the falls. In the Great Smoky Mountains (Tn.). I love hiking and I love waterfalls, but where I live in England, you have to travel a fair way to see any. Absolutely beautiful picture of it! How interesting with the statistic of it being included in the top 10 dangerous hikes! I LOVE the Smokey mountains. I'd love to live right smack in the middle of them if I could. Gorgeous falls ... certainly doesn't look that treacherous.